The index opened above 7974 and stayed in a narrow range, but short covering rally saw the index close strong near the highs of the day at 8069.65, huge gain of 134.75 points. The broader market was strong with 916 advances to 627 declines. Range at the start of the series comes to 7500-8200. Call option 8100-8600 added 40.24 lacs OI with small short covering at 8000 strike price. Put option 8300-7700, 7500 added huge 57.19 lacs OI with profit booking at 7600 strike price. 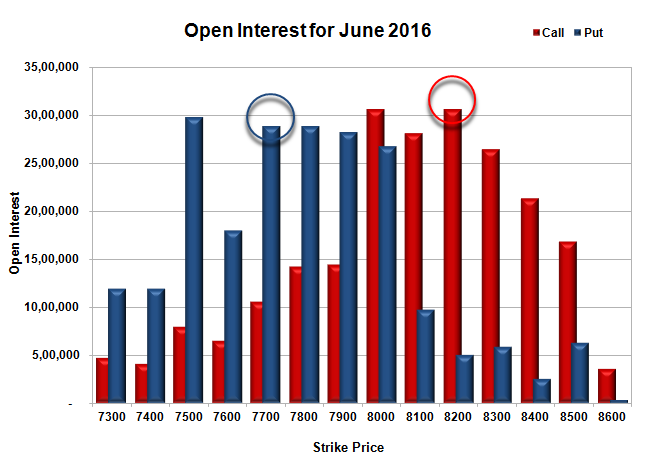 Nifty Open Interest is at 1,94,85,675 up by 46,00,275, with increase in price, probably 100% roll-over with huge long build-up. Bank Nifty Open Interest is at 16,42,530 up by 6,37,470 with increase in price, probably 100% roll-over with huge long build-up. FII’s bought huge 39244 contracts of Index Futures, which includes net 29269 contracts long liquidation and 102263 contracts short covering, with decrease in net OI by 131532 contracts, includes 123751 longs to 84507 shorts for the day. 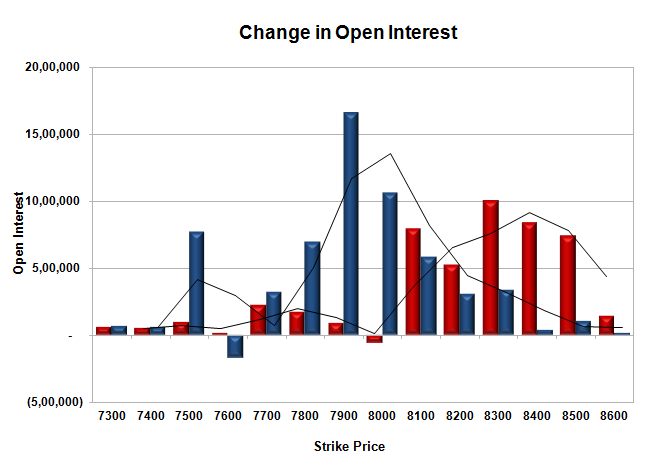 FII’s Index future open contract as on date is 198428 Longs to 54881 Shorts, Net 143547 up by huge 72994 contracts. Initial support at 8000, with huge OI addition of 10.59 lacs and below that at 7900 with OI of 28.23 lacs. 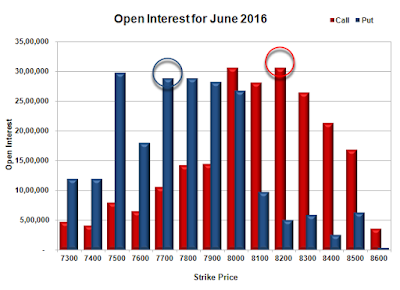 Initial resistance at 8100, with OI of 28.16 lacs and above that at 8200 with highest OI of 30.62 lacs. 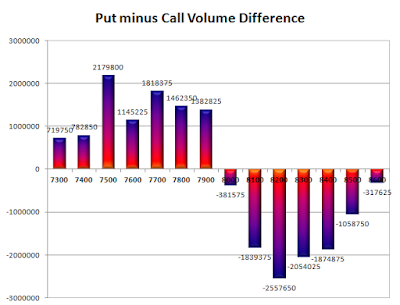 Day Range as per Option Table is 7963 - 8120 and as per VIX is 8005 - 8134 with 8034 as the Pivot.